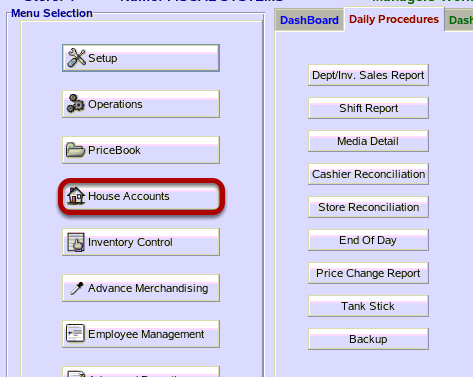 TravStar1 Point Of Sale SystemManager's Work Station House Account ManagementHow Do I Make a Payment on a House Account? How Do I Make a Payment on a House Account? This lesson will teach you the different ways you can make a payment on a house account. From the House Accounts menu, click on the "Payments" button. If you click on the "Yes" button, then the screen will only show payment entries. If you click on the "No" button, then the screen will show all entries for the customer. Note: In this example, the "No" button is pressed. This screen allows you to pay off an individual charge, pay all charges within a certain date range, and select charges to pay until you reach a selected total payment. You can also use this screen to add an invoice or edit a payment. How Do I Make A Payment On A House Account To One Invoice? How Do I Make A Payment On A House Account To All Charges Within A Date Range? How Do I Make A Payment On A House Account For A Specific Amount? How Do I Add An Invoice To A House Account? How Do I Add A Credit To A House Account? 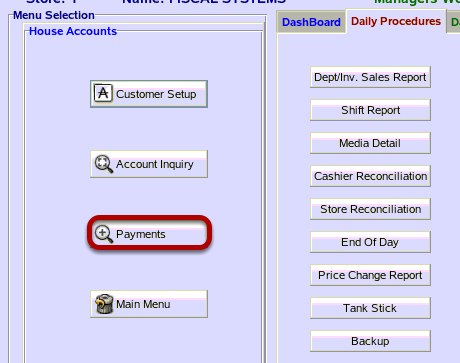 These are the options displayed on the Customer Payments / Adjustments screen. The "Apply" button accepts changes to the customer file. You must select this when finished with your entries. 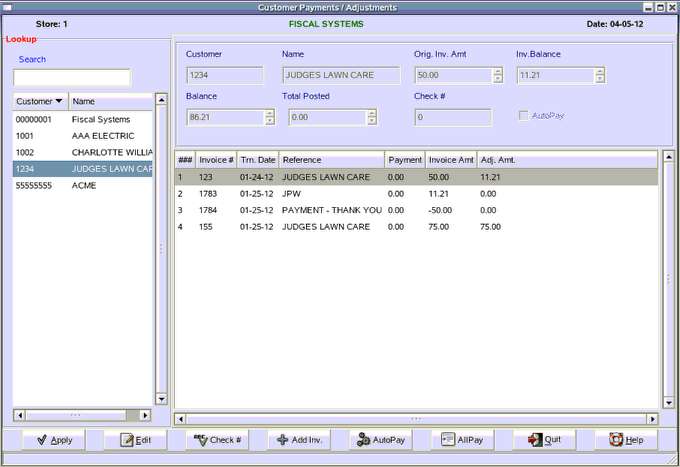 The "Edit" button allows you to edit the payment column or the invoice column. This privilege should be given only to responsible personnel. The "Check #" button will automatically pop up after you click on the "AutoPay" button and highlight an invoice and enter. If you choose "Check #", enter the check number, and then highlight the invoice or invoices to pay. When finished, touch APPLY. The "Ad Inv." button allows you to create an invoice for the customer account. The "AutoPay"button allows you to pay all selected invoices easily. The "AllPay" button allows you to select invoices to pay within a range of dates. This is explained in detail below. The "Quit" button takes you back to the House Account menu. Prev: How Do I Look Up House Account Transaction Details? Next: How Do I Make a Payment on a House Account to One Invoice?